ORLANDO — Julia Gagne recently reflected on all the changes she has seen as her theatrical work comes to an end after 30 years at Valencia College. “This has been a fantastic job, I love this job,” said Gagne. “Thirty years in one place, not many people get to say that.” With her retirement set to begin at the end of April, she now looks forward to directing in other places and trying new things as she enjoys her semi-retirement. Gagne openly admits that she will miss working at Valencia and it is hard for her to let go of the reins. And also having to come to grips with the idea that things will happen after she is gone and without any input from her. The arts and entertainment program has significantly grown over the last 30 years with the numbers of students involved and number of programs offered. Unlike what Valencia now offers; 30 years ago there was no A.A pre-major, no A.S in live entertainment, and no A.S in theatre entertainment technology. She remembers taking people around the Black Box Theatre and Performing Arts Center on Valencia’s East Campus and marveling at the performance spaces the program had to work with. There is now talk about renovation of buildings including an upcoming renovation to the house section of the Performance Arts Center starting in May. Other expansion ideas are looking to increase classroom, lab, and other behind the scenes space to help improve the technical work and training of the future. Technical aspects of theater have greatly changed over the last 30 years including moving lights, new sound technology, and of course the advent of video and computer graphic integration with more advanced productions. But the essential forms of storytelling that define theater have always been vital to the success of any live play for thousands of years. 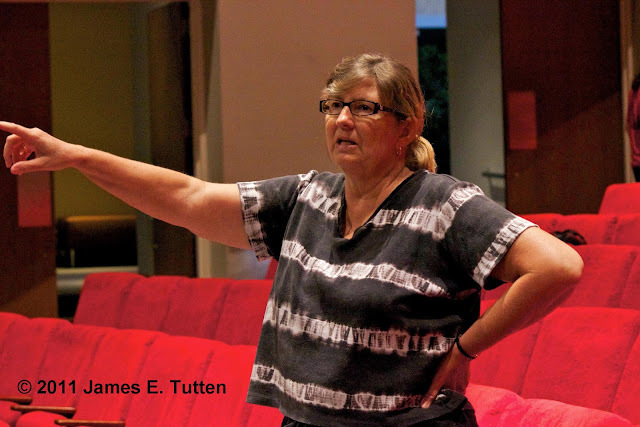 Gagne currently serves as artistic director and theater department chair for Valencia College along with the plays she personally directs and classes she teaches as a professor. Artistic director duty deals with being responsible for the productions Valencia does either by direction or supervision of another director. As theater chair she keeps the schedule of the adjunct instructors and enlists the help of new instructors if they are needed. Replacing Gagne as theater department chair will be John DiDonna, another well-known director and theater professor at Valencia and in the Central Florida community. Gagne was also asked to reflect on the nearly 100 plays she directed at Valencia to note which ones stood out the most for her. Beside her love for the musicals, she is also strongly drawn to the darker plays she has worked on in the past. After her work at Valencia comes to an end, Gagne is taking a short break and spending some time at the beach and more time at a local art studio working on pottery classes. She plans to rest a while before returning to direct a production of “Dirty Rotten Scoundrels” at the Garden Theatre in Winter Garden.